IMPORTANT NOTICE: There are four critical templates in the KFM instructions below that need to be exactly to scale to use. They have been re-scanned in and can be downloaded at the links below. They have all had a three inch wide black block laid atop them at the time of scanning to assure that anyone later printing them out can lay a real ruler atop their own printed copy first and know they are correct and exactly to original scale. They are in the .tiff image format to maximize both their clarity (they've been saved at 200 pixels/inch resolution) and your options to print them out to the correct size. They should be saved to your harddrive first by right mouse button clicking on them each one-at-a-time and selecting "Save Target As...". (You can't view them in your browser directly.) Then, clicking on them later from your file manager, they should open into Windows Imaging or any other imaging program you've designated for this type image file. Print one out and check it with a real ruler laid across the 3 inch black block. If it is exactly 3 inches wide, then print them all out with confidence that you have true-to-scale originals suitable for making your KFM. If the black block is not exactly 3 inches across you'll need to tinker with your printer and/or image program settings and experiment until you have them printing out correctly true-to-scale. However, do not adjust the height and width dimensions of the image itself. Only try adjusting the margins on your printer, the resolution and DPI it is printing at, etc. Note: If anyone can suggest better instructions for the above to assure more people could more easily print these templates out correctly true-to-scale, please pass them on to Shane Connor AND Bruce Beach. The complete KFM instructions include patterns to be cut out and used to construct the fallout meter. At the end of the instructions are extra patterns on 4 unnumbered pages. The reader is urged to use these extra patterns to make KFM's in normal peacetime and to keep the complete instructions intact for use during a recognized crisis period. If Xerox copies of the patterns are used, they should be checked against the originals in order to make sure that they are the same size as the originals. Some older copiers make copies with slightly enlarged dimensions. Even slightly enlarged copies of all the KFM patterns can be made satisfactory provided: (1) on the PAPER PATTERN TO WRAP AROUND KFM CAN, the distances between the 4 marks for the HOLES FOR STOP- THREAD are corrected; and (2) the dimensions of the FINISHED-LEAF PATTERN are corrected. These instructions, including the heading on this page and the illustrative photos, can be photographed without additional screening and rapidly reproduced by a newspaper or printer. If you keep the KFM instructions intact, during a worsening crisis you will be able to use them to help your friends and thousands of your fellow citizens by making them available for reproduction. If a nuclear war ever strikes the United States, survivors of the blast and fire effects would need to have reliable means of knowing when the radiation in the environment around their shelters had dropped enough to let them venture safely outside. Civil defense teams could use broadcasts of surviving radio stations to give listeners a general idea of the fallout radiation in some broadcast areas. However, the fallout radiation can vary widely from point to point and the measurements are likely to be made too far from most shelters to make them accurate enough to use safely. Therefore, each shelter should have some dependable method of measuring the changing radiation dangers in its own area. During a possible rapidly worsening nuclear crisis, or after a nuclear attack, most unprepared Americans could not buy or otherwise obtain a fallout meter -- an Instrument that would greatly improve their chances of surviving a nuclear war. The fact that the dangers from fallout radiation--best expressed in terms of the radiation dose rate, roentgens per hour (R/hr) -- quite rapidly decrease during the first few days, and then decrease more and more slowly, makes it very important to have a fallout meter capable of accurately measuring the unseen, unfelt and changing fallout dangers. Occupants of a fallout shelter should be able to minimize the radiation doses they receive. In order to effectively minimize the radiation doses, a dependable measuring instrument is needed to determine the doses they receive while they are in the shelter and while they are outside for emergency tasks, such as going out to get badly needed water. Also, such an instrument would permit them to determine when it is safe to leave the shelter for good. Untrained families, guided only by these written instructions and using only low cost materials and tools found in most homes, have been able to make a KFM by working 3 or 4 hours. By studying the operating sections of these instructions for about 1-1/2 hours, average untrained families have been able to successfully use this fallout meter to measure dose rates and to calculate radiation doses received, permissible times of exposure, etc. 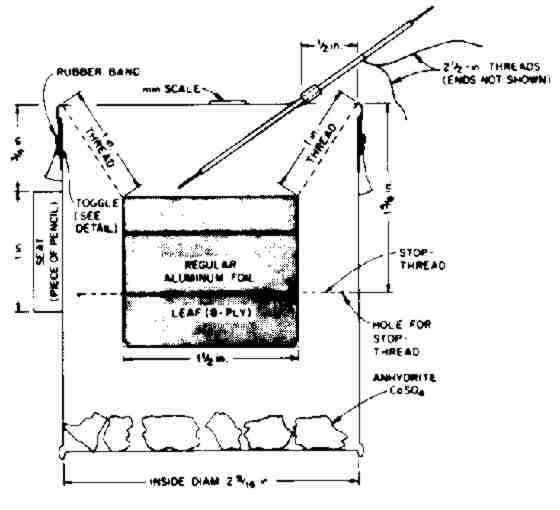 Before building a KFM, persons expecting a nuclear attack within a few hours or days and already in the place where they intend to await attack should work with the following priorities: (1) build or improve a high-protection-factor shelter (if possible, a shelter covered with 2 or 3 feet of earth and separate from flammable buildings). At the same time, make and install a KAP (a homemade shelter-ventilating pump) - if instructions and materials are available. If not available, at least make a Directional Fan. Also store at least 15 gallons of water for each shelter occupant-- if containers are available. (2) Assemble all materials for one or two KFM s. (3) Make and store the drying agent (by healing wallboard gypsum, as later described) for both the KFM and its dry-bucket. (4) Complete at least one KFM. 1. Read ALOUD all of these instructions through section VII, "Tools Needed," before doing anything else. 2. Next assemble all of the needed materials and tools. 3. Then read ALOUD ALL of each section following Section VII before beginning to make the part described in that section. A FAMILY THAT FAILS TO READ ALOUD ALL OF EACH SECTION DESCRIBING HOW TO MAKE A PART, BEFORE BEGINNING TO MAKE THAT PART, WILL MAKE AVOIDABLE MISTAKES AND WILL WASTE TIME. 4. Have different workers, or pairs of workers, make the parts they are best qualified to make. For example, a less skilled worker should start making the drying agent (as described in Section VIII) before other workers start making other parts. The most skilled worker should make and install the aluminum-foil leaves (Sections X and XI). 5. Give workers the sections of the instructions covering the parts they are to build--so they can follow the step-by-step instructions, checking off with a pencil each step as it is completed. 6. Discuss the problems that arise. The head of the family often can give better answers if he first discusses the different possible interpretations of some instructions with other family members, especially teenagers. 7. After completing one KFM and learning to use it, if time permits make a second KFM--that should be a better instrument. A KFM is a simple electroscope-ionization chamber fallout meter with which fallout radiation can be measured accurately. To use a KFM, an electrostatic charge must first be placed on its two separate aluminum-foil leaves. These leaves are insulated by being suspended separately on clean, dry insulating threads. To take accurate readings, the air inside a KFM must be kept very dry by means of drying agents such as dehydrated gypsum (easily made by heating gypsum wallboard, "sheetrock") or silica-gel. (Do not use calcium chloride or other salt.) 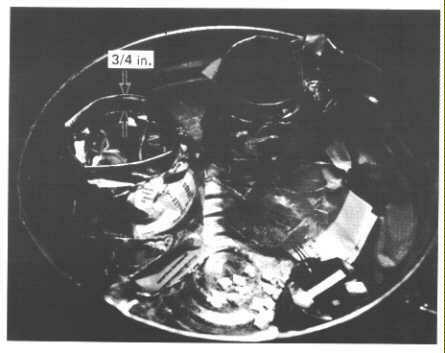 Pieces of drying agent are placed on the bottom of the ionization chamber (the housing can) of a KFM. When the two KFM leaves are charged electrostatically, their like charges (both positive or both negative) cause them to be forced apart. When fallout gamma radiation (that is similar to X rays but more energetic) strikes the air inside the ionization chamber of a KFM, it produces charged ions in this enclosed air. These charged ions cause part or all of the electrostatic charge on the aluminum-foil leaves to be discharged. As a result of losing charge, the two KFM leaves move closer together. A KFM-maker who wants visual proof that his instrument can be partially or wholly discharged by ionizing radiation should persuade his dentist to place the charged KFM about 20 inches directly below a typical dental X-ray machine. For example, when a typical 90 kvp machine was set at 15 milliamps and for a 1/20th second pulse, its columnated X-ray beam partially discharged the KFM's separated aluminum-foil leaves, promptly reducing the initial reading of 15 mm to 9 mm. Other types of machines will require different settings. Many dental X-ray machines are not accurately calibrated, nor do they produce gamma rays, so such tests should not be used in an attempt to check the accuracy of a KFM. To read the separation of the lower edges of the two KFM leaves with one eye, look straight down on the leaves and the scale on the clear plastic cover. Keep the reading eye 12 inches above the SEAT. The KFM should be resting on a horizontal surface. To be sure the reading eye is always at this exact distance, place the lower end of a 12-inch ruler on the SEAT, while the upper end of the ruler touches the eyebrow above the reading eye. It is best to hold the KFM can with one hand and the ruler with the other. Using a flashlight makes the reading more accurate. If a KFM is made and maintained with the specified dimensions and of the specified materials, ITS ACCURACY IS AUTOMATICALLY AND PERMANENTLY ESTABLISHED BY UNCHANGING LAWS OF NATURE. Unlike factory made radiation measuring instruments, A KFM NEVER NEEDS TO BE CALIBRATED OR TESTED WITH A RADIATION SOURCE. A KFM is used with a watch and the following table that is based on numerous calibrations made at Oak Ridge National Laboratory. 5. using this table to find what the dose rate was during the exposure -- as will be described later. Instructions on how to use a KFM are given after those detailing how to make and charge this fallout meter. To get a clearer idea of the construction and use of a KFM, look carefully at the following photos and read their captions. A. An Uncharged KFM. The charging wire has been pulled to one side by its adjustment-thread. This photo was taken looking straight down at the upper edges of the two flat, 8-ply aluminum leaves. At this angle the leaves are barely visible, hanging vertically side by side directly under the zero mark, touching each other and with their ends even. Their suspension-threads insulate the leaves. These threads are almost parallel and touch (but do not cross) each other where they extend over the top of the rim of the can. B. Charging a KFM by a Spark-Gap Discharge from a Tape That Has Been Electrostatically Charged by Being Unwound Quickly. 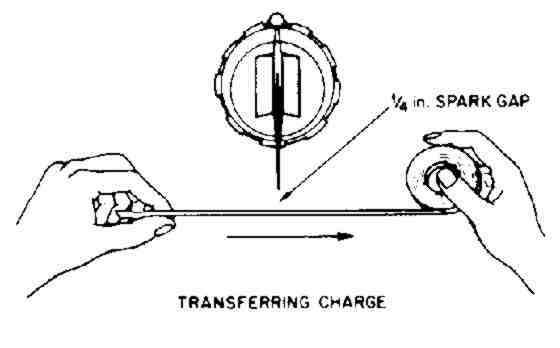 Note that the charged tape is moved so that its surface is perpendicular to the charging-wire. C. A Charged KFM. Note the separation of the upper edges of its two leaves. The charging- wire has been raised to an almost horizontal position so that its lower end is too far above the aluminum leaves to permit electrical leakage from the leaves back up the charging-wire and into the outside air. Also note the SEAT, a piece of pencil taped to the right side of the can, opposite the charging wire. D. Reading a KFM. A 12- inch ruler rests on the SEAT and is held vertical, while the reader's eyebrow touches the upper end of the ruler. The lower edge of the right leaf is under 8 on the scale and the lower edge of the left leaf is under 6 on the scale, giving a KFM reading of 14. For accurate radiation measurements, a KFM should be placed on an approximately horizontal surface, but the charges on its two leaves and their displacements do not have to be equal. NOTE: In these photos, the paper scale is taped to the top of the transparent plastic-film cover. It is better to tape the scale to the under side of the cover, where it is less likely to be damaged. 3. Doorbell-wire, or other light insulated wire (preferably, but not necessarily) a single-strand wire inside the insulation -- 6 inches. 4. Any type of clean, fine thread that has not been anti-static treated will serve to suspend a KFM's leaves. (Almost all kinds of sewing thread and fly-tying thread manufactured in 1987 are anti-static treated, are poor insulators, and are unsatisfactory.) In 1987 the best widely available excellent insulating thread is unwaxed dental floss; floss is not anti-static treated. Most unwaxed dental floss is too thick and stiff for properly suspending KFM leaves, but, since dental floss is not a twisted thread, you can make flexible strand-threads from it. Make each no more than one- quarter as thick as the floss, and about 12 inches lung. First separate several strands at the end of the floss outside its dispenser. Then separate strands while pulling one way on the end of the strand-thread that you want and the other way on the unwanted strands. Use only a clean needle to touch and separate the strands in the middle 6 inches of the 12-inch-long piece of unwaxed dental floss. Very thin monofilament fishing line or leader is an excellent insulator. The 2-pound- test strength, such as Du Pont's "Stren" monofilament fishing line, is best. "Trilene" 2-pound "nylon leader." a monofilament manufactured by Berkley and Company, also is excellent. (A 4-pound monofilament line will serve, but is disadvantageously stiff.) Some modern monofilament lines or leaders such as "Trilene" contain an additive that makes them pliant, but also makes them poorer insulators for the first several hours after being taken out of their dispenser and used to suspend the leaves of a KFM. However, in about 6 hours the silica gel or anhydrite drying agent in a KFM removes this additive and the monofilament becomes as good an insulator as even strands of unwaxed dental floss. To minimize the chance of using a piece of monofilament or other thread that has been soiled and thus changed into a poor insulator, always first remove and discard the outermost layer of thread on any spool that has not been kept clean in a plastic bag or other packaging after being initially unwrapped. To cut 1/16-inch-wide strips from very thin polyethylene film, first cut a piece about 6 x 10 inches. Tape only the two 6-inch-wide ends to a piece of paper (such as a brown grocery bag), so that the film is held flat and smooth on the paper. Make 10 marks. 1/16-inch apart, on each of the two tapes that are holding the film. Place alight so that its reflection on the film enables you to see the edge of the film that you are preparing to cut. Then use a very sharp, clean knife or clean razor blade, guided by the edge of a firmly held ruler, to cut 9 strips, of which you will select the best two. When cutting, hold the knife almost horizontal, with the plane of its blade perpendicular to the taped-down film. Throughout this procedure avoid touching the center parts of the strips. 5. A piece of clear plastic film - a 6 x 6 inch square. Clear vinyl (4 mils thick) used for storm-proofing windows is best, but any reasonably stout and clear plastic will serve. The strong clear plastic used to wrap pieces of cheese, if washed with hot water and soap, is good. Do not use weak plastic or cellophane. Plastic film made from cellulose (such as Flex-O-Pane) and roasting bags are too permeable to water vapor. 6. Cloth duct tape ("silver tape"), or masking tape, or freezer tape, or Scotch-type tape -about 10 square inches. (A roll of Scotch Magic Transparent Tape, if available, should be saved for use in charging the KFM). 7. Band-Aid tape, or masking tape, or freezer tape, or Scotch transparent tape, or other thin and very flexible tapes -- about 2 square inches. 9. Glue -- not essential, but useful to replace Band-Aid and other thin tapes. "One hour" epoxy is best. Model airplane cement is satisfactory. 11. Two strong rubber bands, or string. 12. Several small, transparent plastic bags, such as sandwich bags, to cover the KFM when it is exposed where fallout particles may get on it and contaminate it. Or pieces of thin, transparent plastic film, such as that from bread bags. Also small rubber bands or string. 1. Most hard plastic rubbed on dry paper. This is the best method. a. Plexiglas and most other hard plastics, such as are used in draftsmen's triangles, common smooth plastic rulers, etc. at least 6 inches long. b. Dry paper -- Tough paper, such as clean, strong grocery bag or typing paper. Tissue paper, newspaper, or facial tissue such as Kleenex, or toilet paper are satisfactory for charging, but not as durable. 2. Scotch Magic Transparent tape (3/4 inch width is best), or Scotch Transparent Tape, or PVC. (Polyvinyl chloride) insulating electrical tapes, or a few of the other common brands of Scotch type tapes. 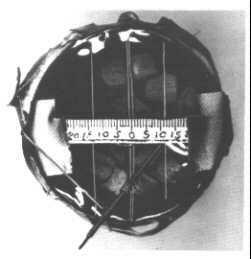 (Some plastic tapes do not develop sufficiently high voltage electrostatic charges when unrolled quickly.) 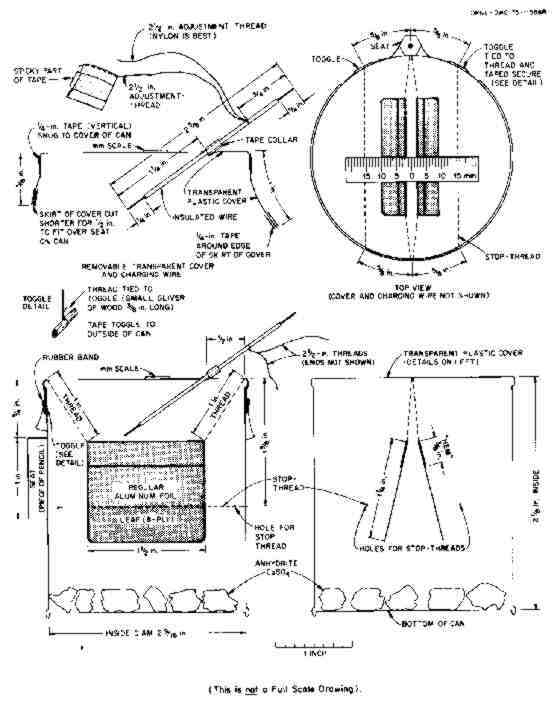 This method cannot be used for charging a KFM inside a dry-bucket, needed for charging when the air is very humid..
1. A watch with a second hand. 2. A flashlight or other light, for reading the KFM in a dark shelter or at night. 3. Pencil and paper -- preferably a notebook. 1. A large bucket, pot, or can, preferably with a top diameter of at least 11 inches. 2. Clear plastic (best is 4-mil-thick clear plastic used for storm windows). A square piece 5 inches wider on a side than the diameter of the bucket to be used. 3. Cloth duct tape, one inch wide and 8 feet long (or 4 ft., if 2 inches wide). Or 16 ft. of freezer tape one inch wide. 4. Two plastic bags 14 to 16 inches in circumference, such as ordinary plastic bread bags. The original length of these bags should be at least 5 inches greater than the height of the bucket. 5. About one square foot of wall board (sheetrock), to make anhydrite drying agent. 6. Two 1-quart Mason jars or other airtight containers, one in which to store anhydrite and another in which to keep dry the KFM charging devices. 7. Strong rubber bands -- enough to make a loop around the bucket. Or string. 1. An airtight container (such as a large peanut butter jar) with a mouth at least 4 inches wide, in which to keep a KFM, along with some drying agent, when it is not being used. Keeping a KFM very dry greatly extends the time during which the drying agent Inside the KFM remains effective. 2. Commercial anhydrite with a color indicator, such as the drying agent Drierite. This granular form of anhydrite remains light blue as long as it is effective as a drying agent; it turns pink when it becomes ineffective. Or use silica gel with color indicator, that is dark blue when effective and that turns light pink when it becomes ineffective. Heating in a hot oven or in a can over a fire reactivates them as drying agents and restores their blue color. Obtainable from laboratory supply sources. Use enough to cover the bottom of the KFM's can no more than 1/2 inch deep. 3. Four square feet of aluminum foil, to make a moisture-proof cover for the dry-bucket. Desirable but not essential tools: a file and a fine-toothed hacksaw blade. 1. For a KFM to measure radiation accurately, the air inside its ionization chamber must be kept very dry. An excellent drying agent (anhydrite) can be made by heating the gypsum in ordinary gypsum wallboard (sheetrock). Do NOT use calcium chloride. 3. Break the white gypsum filling into small pieces and make the largest no more than 1/2 in. across. (The tops of pieces larger than this may be too close to the aluminum foil leaves.) If the gypsum is dry, using a pair of pliers makes breaking it easier. Make the largest side of the largest pieces no bigger than this. 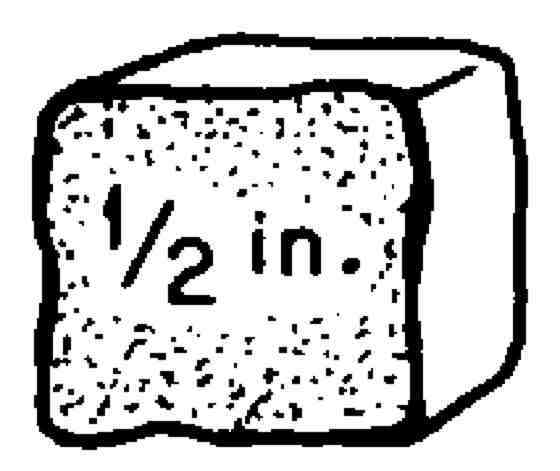 Illustration - Simple 1/2 In cube of gypsum. 4. Dry gypsum is not a drying agent. To drive the water out of the gypsum molecules and produce the drying agent (anhydrite), heat the gypsum in an oven at its highest temperature (which should be above 400 degrees F) for one hour. Heat the gypsum after placing the small pieces no more than two pieces deep in a pan. Or heat the pieces over a fire for 20 minutes or more in a pan or can heated to a dull red. a. So that the right amount of anhydrite can be taken quickly out of its storage jar, put enough pieces of gypsum in a can with the same diameter as the KFM, measuring out a batch of gypsum that almost covers the bottom of the can with a single layer. b. Cut a piece of aluminum foil about 8 in. x 8 in. square, and fold up its edges to form a bowl-like container in which to heat one batch of gypsum pieces. c. Measure out 10 or 12 such batches, and put each batch in its aluminum foil "bowl." d. Heat all of these filled "bowls" of gypsum in hottest oven for one hour. e. As soon as the aluminum foil is cool enough to touch, fold and crumple the edges of each aluminum foil "bowl" together, to make a rough aluminum-covered "ball" of each batch of anhydrite. f. Promptly seal the batches in airtight jars or other airtight containers, and keep containers closed except when taking out an aluminum-covered "ball." 6. Since anhydrite absorbs water from the air very rapidly, quickly put it in a dry airtight container while it is still quite hot. A Mason jar is excellent. 7. To place anhydrite in a KFM, drop in the pieces one by one, being careful not to hit the leaves or the stop-threads. The pieces should almost cover the bottom of the can, with no piece on top of other pieces. 8. To remove anhydrite from a KFM, use a pair of scissors or tweezers as forceps, holding them in a vertical position and not touching the leaves. 2. Skip to step 3 if an 8-ounce can is available. If an 8-ounce can is not available, reduce the height of any other can having an inside diameter of about 2-9/16 inches (such as most soup cans, most pop cans, or most beer cans). To cut off the top part of a can, first measure and mark the line on which to cut. Then to keep from bending the can while cutting, wrap newspaper tightly around a stick or a round wooden tool handle, so that the wood is covered with 20 to 30 thicknesses of paper and the diameter (ideally) is only slightly less than the diameter of the can. One person should hold the can over the paper-covered stick while a second person cuts the can little by little along the marked cutting line. If leather gloves are available, wear them. To cut the can off smoothly, use a file, or use a hacksaw drawn backwards along the cutting line. Or cut the can with a sharp, short blade of a pocketknife by: (1) repeatedly stabbing downward vertically through the can into the paper, and (2) repeatedly making a cut about 1/4 inch long by moving the knife into a sloping position, while keeping its point still pressed into the paper covering the stick. Next, smooth the cut edge, and cover it with small pieces of freezer tape or other flexible tape. 5. Have one person hold the can over a horizontal stick or a round wooden tool-handle, that ideally has a diameter about as large as the diameter of the can. 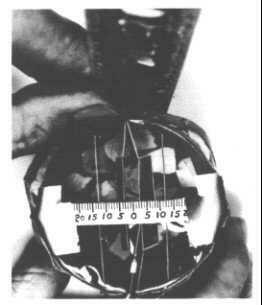 Then a second person can use the sharpened nail and a hammer to punch four very small holes through the sides of the can at the points shown by the four crosses on the pattern. Make these holes just large enough to run a needle through them, and then move the needle in the holes so as to bend back the obstructing points of metal. (Illustration) Single thread threaded through 4 holes to make 2 stop threads. 6. The stop-threads can be installed by using a needle to thread a single thread through all four holes. Use a very clean thread, preferably nylon, and do not touch the parts of this thread that will be inside the can and will serve as the insulating stop-threads. Soiled threads are poor insulators. 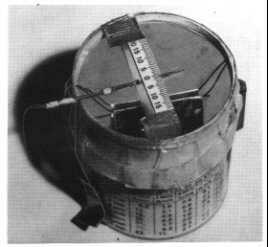 The first toggle and all of the four holes also should be covered with tape, to prevent air from leaking into the can after it has been covered and is being used as an ionization chamber. 1. Cut out a piece of standard aluminum foil approximately 4 inches by 8 inches. 2. Fold the aluminum foil to make a 2-ply (= 2 thicknesses) sheet approximately 4 inches by 4 inches. 3. Fold this 2-ply sheet to make a 4-ply sheet approximately 2 inches by 4 inches. 4. Fold this 4-ply sheet to make an 8-ply sheet (8 sheets thick) approximately 2 inches by 2 inches, being sure that the two halves of the second-fold edge are exactly together. This third folding makes an 8-ply aluminum foil sheet with one corner exactly square. 5. Cut out the FINISHED-LEAF PATTERN, found on the following Pattern Page B. Note that this pattern is NOT a square and that it is smaller than the 8-ply sheet. Flatten the 8 thicknesses of aluminum foil with the fingers until they appear to be a single thin, flat sheet. 6. Hold the FINISHED-LEAF PATTERN on top of the 8-ply aluminum foil sheet, with the pattern's THIRD-FOLD EDGE on top of the third-fold edge of the 8-ply aluminum sheet. Be sure that one lower corner of the FINISHED-LEAF PATTERN is on top of the exactly square corner of the 8-ply aluminum sheet. 7. While holding a straight edge along the THREAD LINE of the pattern, press with a sharp pencil so as to make a shallow groove for the THREAD LINE on the 8-ply aluminum sheet. Also using a sharp pencil, trace around the top and side of the pattern, so as to indent (groove) the 8-ply foil. 8. Remove the pattern and cut out the 8-ply aluminum foil leaf. Then, in order to prevent possible excessive electrical discharge from overly sharp points on the lower corners of the leaf, cut about 11/16-inch (triangle) off each of its two lower corners. 9. While holding a straight edge along the indented THREAD LINE, lift up the OPEN EDGE of the 8-ply sheet (keeping all 8 plies together) until this edge is vertical, as illustrated. Remove the straight edge, and fold the 8-ply aluminum along the THREAD LINE so as to make a flat-folded hem. 10. Open the flat-folded hem of the finished leaf until the 8-ply leaf is almost flat again, as shown by the pattern, from which the FINISHED-LEAF PATTERN has already been cut. 11. Prepare to attach the aluminum-foil leaf to the thread that will suspend it inside the KFM. *If only heavy duty aluminum foil (sometimes called "extra heavy duty") is available, make 5-ply leaves of the same size, and use the table for the 8-ply KFM to determine radiation dose rates. To make a 5-ply leaf, start by cutting out a piece of foil approximately 4 inches by 4 inches. Fold it to make a 4-ply sheet approximately 2 inches by 2 inches, with one corner exactly square. Next from a single thickness of foil cut a square approximately 2 inches by 2 inches. Slip this square into a 4-ply sheet, thus making a 5-ply sheet. Then make the 5-ply leaf, using the FINISHED-LEAF PATTERN, etc. as described for making an 8-ply leaf. If no epoxy glue* is available to hold down the hem and prevent the thread from slipping in the hem, cut two pieces of tape (Band-Aid tape is best; next best is masking or freezer tape; next best, Scotch tape). After first peeling off the paper backing of Band-Aid tape, cut each piece of tape 1/8 inch by 1 inch long. Attach these two pieces of tape to the finished 8-ply aluminum leaf with the sticky sides up, except for their ends. As shown by the pattern on the following pattern page, secure 1/8 inch of one end of a tape strip near one corner of the 8-ply aluminum foil leaf by first turning under this 1/8-inch end; that is, with this end's sticky side down. Then turn under the other 1/8-inch-long end, and attach this end below the THREAD LINE. Slant each tape strip as illustrated on Pattern (C). Be sure you have read through step 18 before you do anything else. 12. Cut an 8-1/2 inch piece of fine, unwaxed, very clean thread that has not been anti-static treated. See INSTRUCTIONS, Page 6 for excellent insulating threads and substitutes. In l986 most sewing threads are anti-static treated and are too poor insulators for use in a KFM. 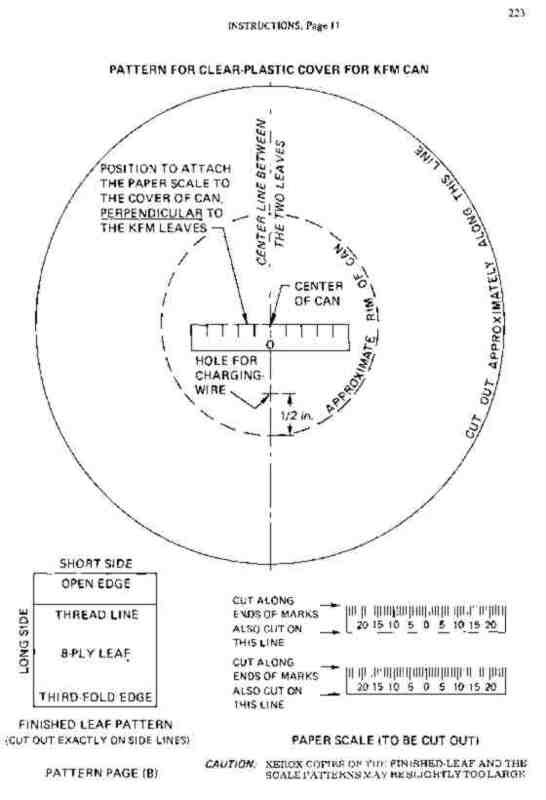 Cut out Pattern (C), the guide sheet used when attaching a leaf to its suspending thread. Then tape Pattern (C) to the top of a work table. Cover the two "TAPE HERE" rectangles on Pattern (C) with pieces of tape, each piece the size of the rectangle. Then cut two other pieces of tape each the same size and use them to ONTO the thread ONTO the guide sheet, on top of the 'TAPE HERE" rectangles. Be very careful not to touch the two 1-inch parts of the thread next to the outline of the finished leaf, since oil and dirt even on clean fingers will reduce the electrical insulating value of the thread between the leaf and the top rim of the can. 13. With the thread still taped to the paper pattern and while slightly lifting the thread with a knife tip held under the center of the thread, slip the finished leaf under the thread and into position exactly on the top of the leaf outlined on the pattern page. Hold the leaf in this position with two fingers. 14. While keeping the thread straight between its two taped-down ends, lower the thread so that it sticks to the two plastic strips. Then press the thread against the plastic strips. 15. With the point of the knife, hold down the center of the thread against the center of the THREAD LINE of the leaf. Then, with two fingers, carefully fold over the hem and press it almost flat. Be sure that the thread comes out of the corners of the hem. Remove the knife, and press the hem down completely flat against the rest of the leaf. 16. Make small marks on the thread at the two points shown on the pattern page. Use a ball-point pen if available. 17. Loosen the second two small pieces of tape from the pattern paper, but leave these tapes stuck to the thread. 18. Cut 5 pieces of Band-Aid tape, each approximately 1/8 inch by 1/4 inch, this small. Use 2 of these pieces of tape to secure the centers of the side edges of the leaf. 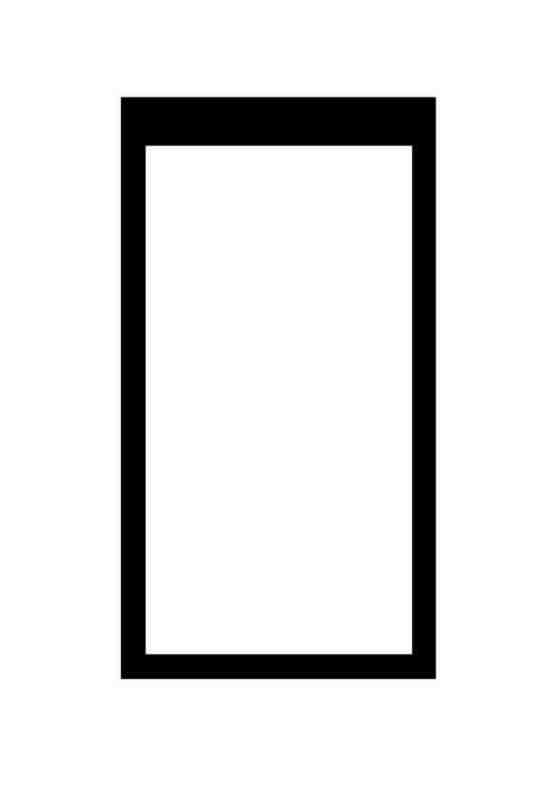 Place the 5 pieces as illustrated in the SIDE VIEW sketch below. Or use tiny droplets of epoxy, applied with a needle, to secure the side edges and to hold down the hem. a. Make a black stripe 1/8-inch wide on the hem side of the lower edge of each leaf, if the drying agent to be used is white anhydrite made from gypsum, or light blue Drierite. It is best to use a waterproof marker, such as black Marko by Flair. b. Make a white stripe, if the drying agent to be used is dark blue silica gel. Liquid Paper correction fluid, or white ink, serves well. *If using epoxy or other glue, use only a very little to hold down the hem, to attach the thread securely to the leaf and to glue together any open edges of the plied foil. Most convenient is "one hour" epoxy, applied with a toothpick. Model airplane cement requires hours to harden when applied between sheets of aluminum foil. To make sure no glue stiffens the free thread beyond the upper corners of the finished leaf, put no glue within 1/4 inch of a point where thread will go out from the folded hem of the leaf. The instructions in step 11 are for persons lacking "one hour" epoxy or the time required to dry other types of glue. Persons using glue instead of tape to attach the leaf to its thread should make appropriate use of the pattern on the following page and of some of the procedures detailed in steps 12 through 18. COVER THE TWO "TAPE HERE" RECTANGLES WITH SAME-SIZED PIECES OF TAPE, IN ORDER TO KEEP FROM TEARING THIS PAPER WHEN REMOVING TWO ADDITIONAL PIECES OF TAPE. THEN, BY PUTTING TWO OTHER PIECES OF TAPE THIS SAME SIZE ON TOP OF THE FIRST TWO PIECES, TAPE THE THREAD ONTO THIS GUIDE SHEET, AND LATER ATTACH A LEAF TO THE TAPED-DOWN THREAD. Fig. 225 Pattern (C) how to tape aluminum leaves to thread line. WARNING: The parts of the thread that will be inside the Can and on which the leaf will be suspended must serve to insulate the high-voltage electrical charges to be placed on the leaf Therefore, the suspended parts of the thread must be kept very clean. 2. Use the two small pieces of 'ape stuck to the ends of a leaf-suspending thread to attach the thread to the outside of the can. Attach the tapes on opposite sides of the can, so as to suspend the leaf inside the can. See END VIEW sketch. 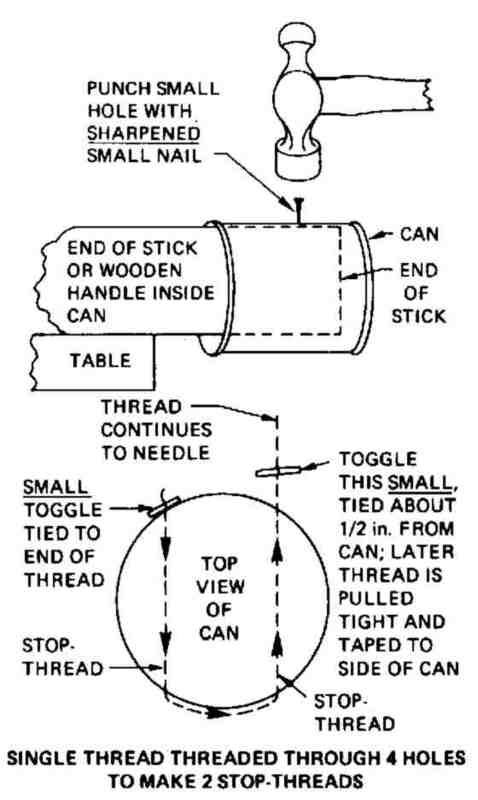 Each of the two marks on the attached thread MUST rest exactly in a notch (or on the top of the rim of the can, if you are unable to make notches). Be sure that the hem-side of each of the two leaves will face outward. See END VIEW sketch. a. The smooth sides of the two leaves are not wrinkled or bent and face each other, and are flush ("right together") when not charged. See END VIEW sketch and study the first photo illustration, "An Uncharged KFM". b. The upper edges of the two leaves are suspended side by side and at the same distance below the top of the can. 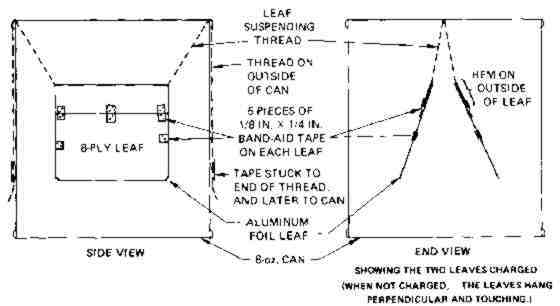 c. The leaf-suspending threads are in their notches in the top of the rim of the can (or are taped with Band-Aid to the top of the rim of the can) so that putting the cover on will not move the threads. d. No parts of the leaf-suspending threads inside the can are taped down to the can or otherwise restricted. 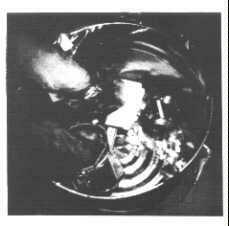 e. The leaf-suspending parts of the threads inside the can do not cross over, entangle or restrict each other. 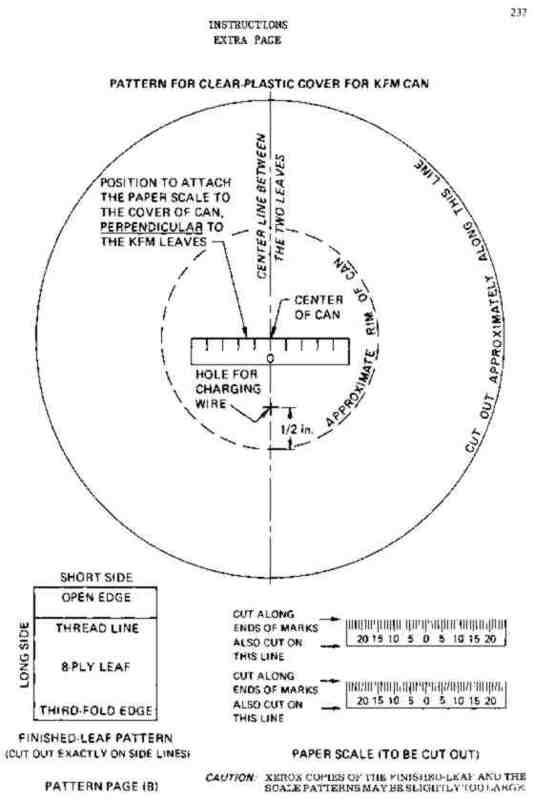 f. The threads come together where they go over the rim of the can, and the leaves are flat and hang together as shown in the first photo illustration, "An Uncharged KFM"
g. The leaves look like these photographed leaves. If not, make new, better leaves and install them. 4. Cover with tape the parts of the threads that extend down the outside of the can, and also cover with more tape the small pieces of tape near the ends of the threads on the outside of the can. Or use epoxy or other waterproof glue to attach the parts of the threads on the outside of the can securely to the can. 5. To make the SEAT, cut a piece of a wooden pencil, or a stick, about one inch long and tape it securely to the side of the can along the center line marked SEAT on the pattern. Be sure the upper end of this piece of pencil is at the same position as the top of the location for the SEAT outlined on the pattern. The top of the SEAT is 3/4 inch below the top of the can. Be sure not to cover or make illegible any part of the table printed on the paper pattern. 6. Cut out one of the "Reminders for Operators" and glue and/or tape it to the unused side of the KFM. Then it is best to cover all the sides of the finished KFM with clear plastic tape or varnish. 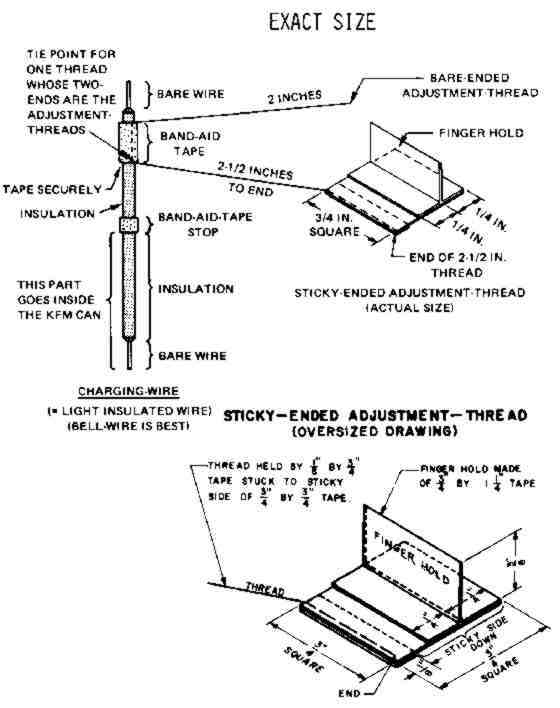 This will keep sticky-tape on the end of an adjustment thread or moisture from damaging the "Reminders" or the table. 1. Cut out the paper pattern for the cover from the Pattern Page (B). 4. Make the cover so it fit snugly, but can be taken off and replaced readily. Keep vertical the small part of the tape that presses against the rim of the can while pulling the length of the tape horizontally around the can so as to bind the top of the plastic cover snugly to the rim. 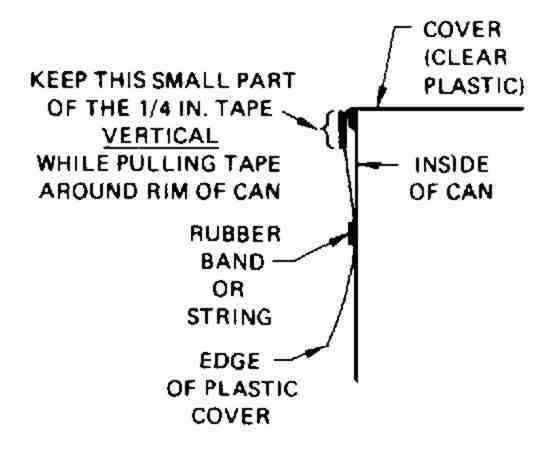 If this small part of the tape is kept vertical, the lower edge of the tape will not squeeze the plastic below the rim of the can to such a small circumference as to prevent the cover from being removed quite easily. The drying agent inside a KFM is O.K. if, when the charged KFM is not exposed to radiation, its readings decrease by 1 mm or less in 3 hours. Reading: With the reading eye 12 inches vertically above the seat. note on the tom scale the separation of the lower edges of the leaves. If the right leaf is at 10 mm and the left leaf is at 3 mm. the KFM reads 10 mm. Never take a reading while a leaf is touching a stop-thread. Never use a reading that is less than 5 mm. Finding a dose rate: If before exposure a KFM reads 17 mm and if after a l-minute exposure it reads 5 mm. the difference in readings is 12 mm the attached table shows the dose rate was 9.6 R hr during the exposure. Finding a dose: If a person works outside for 3 hours where the dose rate is 2 R hr. what is his radiation dose? Answer: 3 hr x 2 R hr = 6 R.
Finding how long it takes to get a certain R dose: If the dose rate is 1.6 R hr outside and a person is willing to take a 6 R dose, how long can he remain outside? Answer: 6 R /1.6 R/hr 3.75 hr = 3 hours and 45 minutes. 6 R per day can be tolerated for up to two months without losing the ability to work. 100 R in a week or less is not likely to seriously sicken. 350 R in a few days results in a 50-50 chance of dying, under post-attack conditions. 600 R in a week or less is almost certain to cause death within a few weeks. 5. With scissors, cut off the "skirt" of the plastic cover until it extends only about one inch below the top of the rim of the can. 6. Make a notch in the "skirt," about one inch wide, where it fits over the pencil SEAT attached to the can. The "skirt" in this notched area should be only about 5/8 of an inch long, measured down from the top of the rim of the can. 7. Remove the plastic cover, and then tape the lower edges of the "skirt," inside and out, using short lengths of 1/4-inch-wide tape. Before securing each short piece of tape, slightly open the tucks that are being taped shut on their edges, so that the "skirt" flares slightly outward and the cover can be readily removed. 8. Make the charging-wire by using the full-size, exact-size pattern on the right. Doorbell wire with an outside diameter of about 1116 inch is best, but any lightweight insulated wire, such as part of a lightweight two-wire extension cord split in half, will serve. The illustrated wire is much thicker than bell wire. To stop tape from possibly slipping up or down the wire, use a very little glue. If a very thin plastic has been used for the cover, a sticky piece of tape may need to be attached to the end of the bare-ended adjustment thread, so both threads can be used to hold the charging wire in a desired position. The best tape to attach to an end of one of the adjustment-threads is cloth duct tape. A square piece 3/4 inch by 3/4 inch is the sticky base. To keep this tape sticky (free of paper fibers), the paper on the can should be covered with transparent tape or varnish. A piece about 1/8 inch by 314 inch serves to stick under one end of the sticky base, to hold the adjustment-thread. 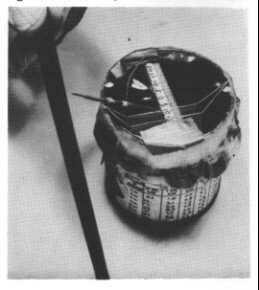 A 3/4 inch by 1- 1/4 inch rectangular piece of tape is used to make the finger hold -- important for making adjustments inside a dry-bucket. With a needle or pin, make a hole in the plastic cover 1/2 inch from the rim of the can and directly above the upper end of the CENTER LINE between the two leaves. The CENTER LINE is marked on the pattern wrapped around the can. Carefully push the CHARGING-WIRE through this hole (thus stretching the hole) until all of the CHARGING-WIRE below its Band-Aid-tape stop is inside the can. 9. From the Pattern Page (B) cut out the SCALE. Then tape the SCALE to the under side of the plastic cover, in the position shown on the pattern for the cover, and also by the drawings. Preferably use transparent tape. Be careful not to cover with tape any of the division lines on the SCALE between 20 on the right and 20 on the left of 0. 10. Put the plastic cover on the KFM can. When preparing to charge a KFM, be sure its anhydrite is fresh. (Under humid conditions, sometimes in only 2 days enough water vapor will go through the plastic cover to make the drying agent ineffective.) Be sure no piece of anhydrite is on top of another piece. Re-read VIII 7 and VIII 8. 1. Charging a KFM with Hard Plastic Rubbed on Dry Paper. b. Select a piece of Plexiglas, a draftsman's plastic triangle, a smooth plastic ruler, or other piece of hard, smooth plastic. (Unfortunately, not all types of hard plastic can be used to generate a sufficient electrostatic charge.) Be sure the plastic is dry. For charging a KFM (especially inside a dry-bucket), cut a rectangular piece of hard plastic such as Plexiglas about 1-1/2 by 6 inches. Sharp corners and edges should be smoothed. To avoid contaminating the charging end with sweaty, oily fingers, it is best to mark the other end with a piece of tape, and to hold it only by its taped end. 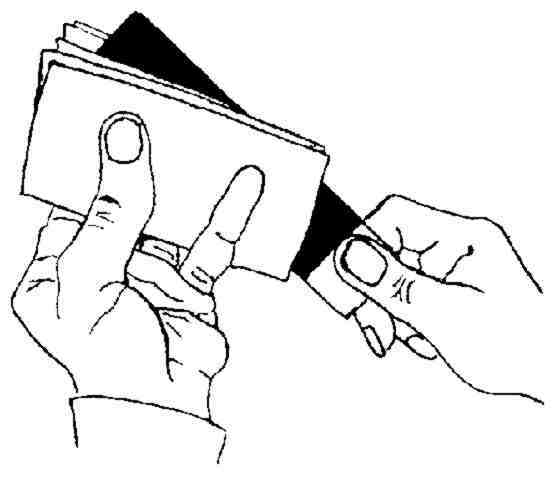 d. Fold the square of paper in the middle, and move the hard plastic rapidly back and forth so that it in the middle of this folded square is rubbed vigorously on the paper while the outside of this folded square of paper is squeezed firmly between thumb and little finger on one side, and the ends of three fingers on the other. To avoid discharging the charge on the plastic to the fingers, keep them away from the edges of the paper. See sketch..
e. Move the electrostatically charged part of the rubbed plastic rather slowly past the upper end of the charging-wire, while looking straight down on the KFM. Keep the hard plastic approximately perpendicular to the charging- wire and about 1/4 to 1/2 inch away from its upper end. The charge jumps the spark gaps and charges the leaves of the KFM. Charge the leaves sufficiently to give a reading of at least 15 mm. f. Pull down on an insulating adjustment-thread to raise the lower end of the charging-wire. (If the charging-wire has been held in its charging position by its sticky ended adjustment-thread being stuck to the top of the clear plastic cover, to avoid possibly damaging the threads: (1) pull down a little on the bare-ended adjustment-thread; and (2) detach, pull down on, and secure the sticky-ended adjustment-thread to the side of the can, so as to raise and keep the lower end of the charging-wire close to the underside of the clear plastic cover.) Do not touch the charging-wire, because its insulation usually is not good enough to prevent the charge from bleeding off into the fingers. g. To get the most accurate readings possible, lightly bump or shake the charged KFM (to remove any unstable part of the charge) before taking the initial reading. h. If the initial reading is more than 20 mm, to get the most accurate reading possible carefully partially discharge the leaves (by touching them with the charging-wire while guiding the wire with your fingers on its insulation), to reduce to 20 mm or slightly less the initial reading that you will use. Or completely discharge, and recharge to 20 mm or slightly less. i. To keep a KFM in excellent condition and to enable its drying agent to last much longer before becoming ineffective, put the whole KFM in an airtight container, such as a large peanut butter jar, with drying agent about an inch deep on its bottom. Or at least keep the charging paper and the hard plastic charging strip dry in a sealable container, such as a Mason jar, with some drying agent. b. 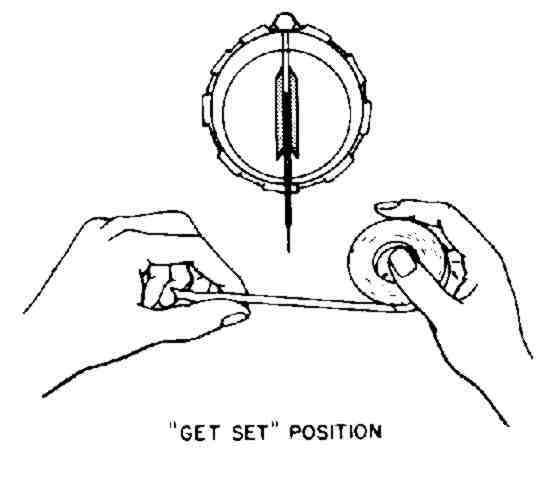 The sketch shows the "GET SET" position, preparatory to unrolling the Scotch Magic Transparent Tape, PVC, electrical tape, or other tape. Be sure to first remove the roll from its dispenser. Some of the other kinds of tape will not produce a high enough voltage. c. QUICKLY unroll 10 to 12 inches of tape by pulling its end with the left hand, while the right hand allows the roll to unwind while remaining in about the same "GET SET" position only an inch or two away from the KFM. d. While holding the unwound tape tight, about perpendicular to the charging-wire, and about 114 inch away from the end of the charging-wire, promptly move both hands and the tape to the right rather slowly taking about 2 seconds to move about 8 inches. 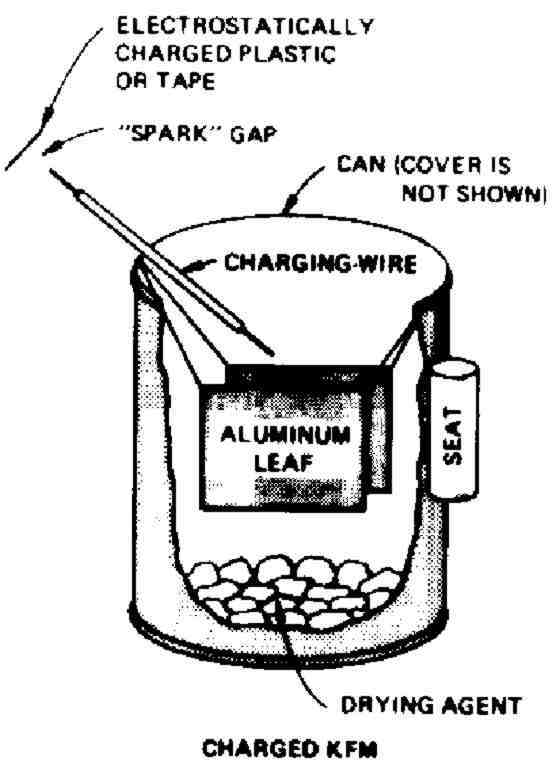 The electrostatic charge on the unwound tape "jumps" the spark gaps from the tape to the upper end of the charging-wire and from the lower end of the charging-wire to the aluminum leaves, and charges the aluminum leaves. Be sure neither leaf is touching a stop-thread. Try to charge the leaves enough to spread them far enough apart to give a reading of at least 15 mm, but no more than 20 mm after the KFM has been gently bumped or shaken to remove any unstable part of the charge. e. Pull down on an insulating adjustment-thread to raise the lower end of the charging-wire. If the charging-wire has been held in charging position by its sticky-ended adjustment-thread being stuck to the top of the clear plastic cover, it is best first to pull down a little on the bare-ended adjustment-thread, and then to move, pull down on, and secure the sticky-ended adjustment-thread to the side of the can so that the lower part of the charging-wire is close to the underside of the clear plastic cover. Do not touch the charging-wire. f. Rewind the tape tight on its roll, for future use when other tape may not be available. Put fresh drying agent in your KFM and then charge and test the KFM in a location where it is not exposed to abnormal radiation. Take an initial reading. If after 3 hours its reading has decreased by 1 mm, or less, this means that its leaf-suspending threads are good insulators and that your KFM can reliably measure dose rates as low as 0.03 roentgens per hour (30 milliroentgens per hour). By post-attack standards, 30 mR/hr is a low dose rate. In a whole month of continuous exposure (an impossibility, because fallout decays). 30 mR/hr would result in a dose of 21.9 roentgens - not enough to incapacitate. Warning: In heavy fallout areas, for the first few days after fallout deposition the dose rates inside even most good shelters will be higher than 0.03 R/hr. 1. Be sure the pieces of anhydrite in the bottom of the ionization chamber (the can) are in a single layer, with no piece on top of another and the top of no piece more than 112 inch above the bottom of the can. 2. Check to be sure that the threads suspending the leaves are not crossed; then try to charge the KFM again. 3. If the KFM still cannot be charged, replace the used anhydrite with fresh anhydrite. 4. If you cannot charge a K FM when the air is very humid, charge it inside its dry-bucket. If a KFM or other radiation measuring instrument gives unexpectedly high readings inside a good shelter, wipe all dust off the outside of the instrument and repeat the radiation-measurements. Especially when exposing a fallout meter outdoors where there is fresh fallout, keep the instrument in a lidded pot, plastic bag, or other covering to avoid the possibility of having it contaminated with fallout particles and afterwards getting erroneously high radiation measurements. By charging a KFM while it is inside a dry-bucket with a transparent plastic cover (see illustration), this fallout meter can be charged and used even if the relative humidity is 100% outside the dry-bucket. The air inside the dry-bucket is, kept very dry by a drying agent placed on its bottom. About a cupful of anhydrite serves very well. The pieces of this dehydrated gypsum need not be as uniform in size as is best for use inside a KFM, but do not use powdered anhydrite. 1. Remove the handle of a large bucket, pot, or can preferably with a top diameter of at least 11 inches. A 4-gallon bucket having a top diameter of about 14 inches and a depth of about 9 inches is ideal. A plastic tub approximately this size is satisfactory. If the handle-supports interfere with stretching a piece of clear plastic film across the top of the bucket, remove them, being sure no sharp points remain. 2. Cut out a circular piece of clear plastic with a diameter about 5 inches larger than the diameter of the top of the bucket. Clear vinyl 4 mils thick, used for storm windows, etc., is best. Stretch the plastic smooth across the top of the bucket, and tie it in place, preferably with strong rubber bands looped together to form a circle. 3. Make a plastic top that fits snugly but is easily removable, by taping over and around the plastic just below the top of the bucket. One-inch-wide cloth duct tape, or one-inch-wide glass-reinforced strapping tape, serves well. When taping, do not permit the lower edge of the tape to be pulled inward below the rim of the bucket. (Illustration) Cutting the clear plastic cover. 4. Cut two small holes (about 1 inch by 2 inches) in the plastic cover, as illustrated. Then make the radial cuts (shown by dotted lines) outward from the small holes, out to the solid-line outlines of the 3 inch by 4 inch hand-holes, so as to form small flaps. 5. Fold the small flaps upward, so they are vertical. Then tape them on their outer sides, so they form a vertical "wall" about 3/4 inch high around each hand-hole. 7. Insert a plastic bag into each hand-hole, and fold the edge of the plastic bag about 1/2 inch over the taped vertical "wall" around each hand-hole. 8. Strengthen the upper parts of the plastic bags by folding 2-inch pieces of tape over the top of the "wall" around each hand-hole. 9. Make about a quart of anhydrite by heating small pieces of wall-board gypsum, and keep this anhydrite dry in a Mason jar or other airtight container with a rubber or plastic sealer. 10. Make a circular aluminum-foil cover to place over the plastic cover when the dry-bucket is not being used for minutes to hours. 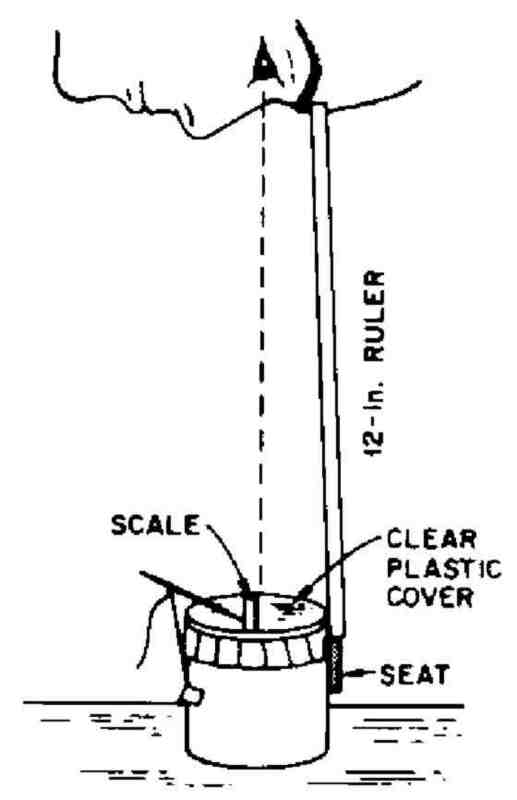 Make this cover with a diameter about 4 inches greater than the diameter of the top of the bucket, and make it fit more snugly with an encircling loop of rubber bands, or with string. Though not essential, an aluminum-foil cover reduces the amount of water vapor that can reach and pass through the plastic cover, thus extending the life of the drying agent. a. Taking off wrist watch and sharp-pointed rings that might tear the plastic bags. c. Replacing the plastic cover, that is best held in place with a loop of rubber bands. d. Charging the KFM with your hands inside the plastic bags, operating the charging device. Have another person illuminate the KFM with a flashlight. When adjusting the charging-wire, move your hands very slowly. See the dry-bucket photos. (3) stored at least 15 gallons of water for each shelter occupant if you can obtain containers. Having a KFM or any other dependable fallout meter and knowing how to operate it will enable you to minimize radiation injuries and possible fatalities, especially by skillfully using a high-protection-factor fallout shelter to control and limit exposures to radiation. By studying this section you first will learn how to measure radiation dose rates (roentgens per hour = R/hr), how to calculate doses [It] received in different time intervals, and how to determine time intervals (hours and/or minutes) in which specified doses would be received. Then this section lists the sizes of doses (number of R) that the average person can tolerate without being sickened, that he is likely to survive, and that he is likely to be killed by. Most fortunately for the future of all living things, the decay of radioactivity causes the sandlike fallout particles to become less and less dangerous with the passage of time. Each fallout particle acts much like a tiny X-ray machine would if it were made so that its rays, shooting out from it like invisible light, became weaker and weaker with time. Contrary to exaggerated accounts of fallout dangers, the radiation dose rate from fallout particles when they reach the ground in the areas of the heaviest fallout will decrease quite rapidly. 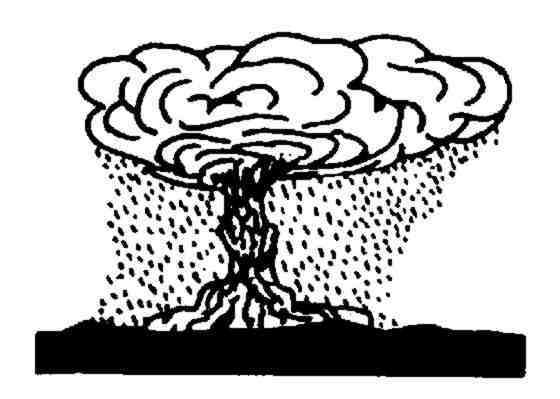 For example, consider the decay of fallout from a relatively nearby, large surface burst, at a place where the fallout particles are deposited on the ground one hour after the explosion. At this time one hour after the explosion, assume that the radiation dose rate (the best measure of radiation danger at a particular time) measures 2,000 roentgens per hour (2,000 R/hr) outdoors. Seven hours later the dose rate is reduced to 200 R/hr by normal radioactive decay. Two days after the explosion, the dose rate outdoors is reduced by radioactive decay to 20 R/hr. After two weeks, the dose rate is less than 2 R/hr. When the dose rate is 2 R/hr, people can go out of a good shelter and work outdoors for 3 hours a day, receiving a daily dose of 6 roentgens, without being sickened. In places where fallout arrives several hours after the explosion, the radioactivity of the fallout will have gone through its time period of most rapid decay while the fallout particles were still airborne. If you are in a location so distant from the explosion that fallout arrives 8 hours after the explosion, two days must pass before the initial dose rate measured at your location will decay to 1/10 its initial intensity. 1. Reread Section IV, "What a KFM Is and How it Works." Also reread Section XIII, "Two Ways to Charge a KFM," and actually do each step immediately after reading it. 2. Charge the KFM so that it reads at least 15 mm. Next raise the lower end of the charging wire. Then gently bump or shake the KFM to remove any unstable part of the charge. Read the apparent separation of the lower edges of the leaves while the KFM rests on an approximately horizontal surface. If the reading is larger than 20 mm, bleed off enough charge to reduce the initial reading to 20 mm or slightly less, for maximum accuracy. Never take a reading while a leaf is touching a stop-thread. 3. To prevent possible contamination of a KFM (or of any other fallout meter) with fallout particles, keep it inside a plastic bag or other covering when there is risk of fallout particles being deposited or blown onto it. An instrument contaminated with fallout particles can give too high readings, especially of the low dose-rate measurements made inside a good shelter. 4. 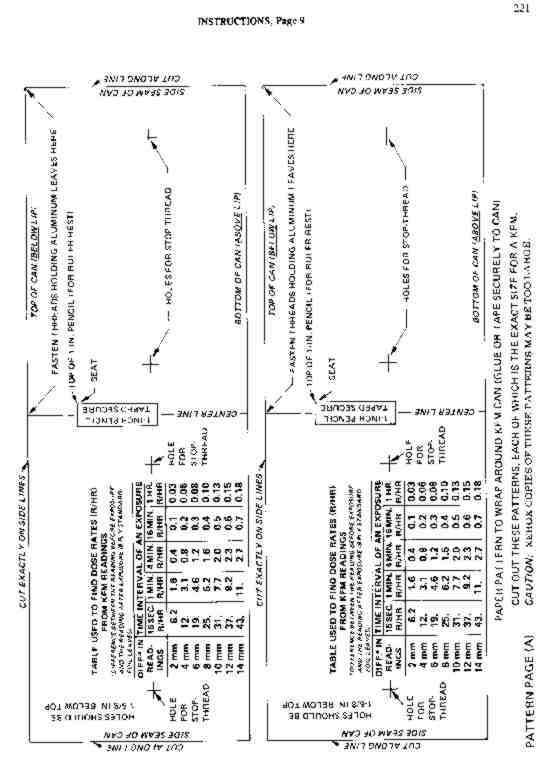 Expose the KFM to fallout radiation for one of the time intervals shown in the vertical columns of the table attached to the KFM - (Study the following table.) If the dose rate is not known even approximately, first expose the fully charged KFM for one minute. For dependable measurements outdoors, expose the charged KFM about 3 feet above the ground. The longer outdoor exposures usually are best made by attaching the KFM with 2 strong rubber hands to a stick or pole, being careful never to tilt the KFM too much. 5. Read the KFM after the exposure, while the KFM rests on an approximately horizontal surface. (a) Not less than 5 mm. 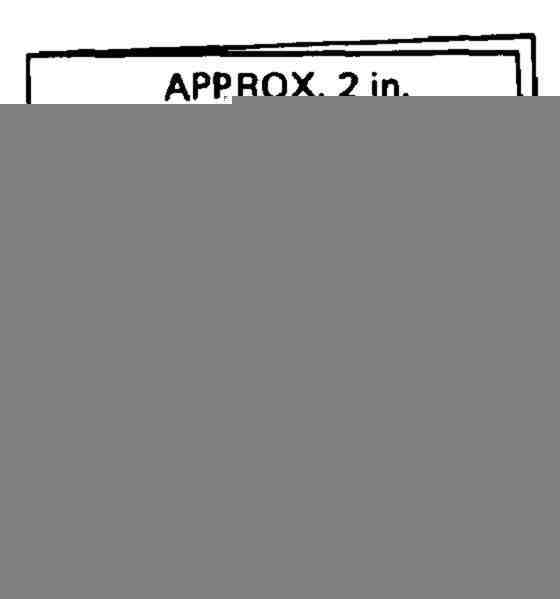 (b) At least 2 mm less than the reading before the exposure. 7. Calculate by simple subtraction the difference in the apparent separation of the lower edges of the leaves before the exposure and after the exposure. 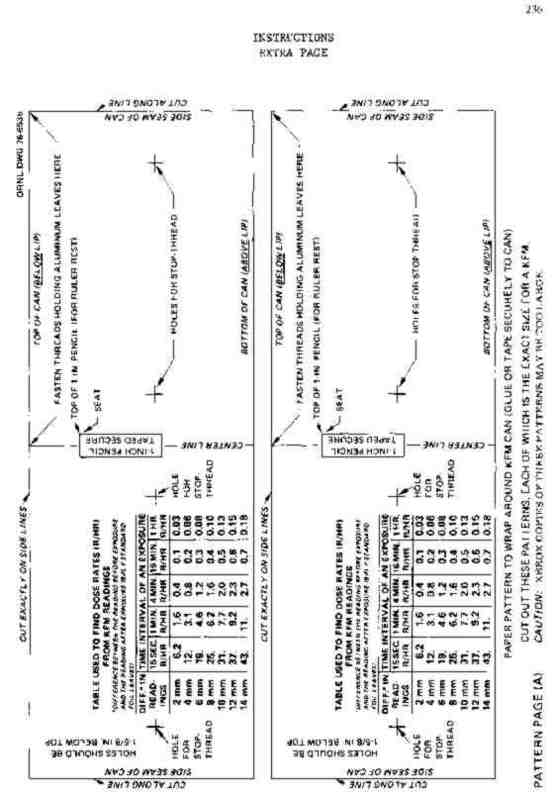 An example: If the reading before the exposure is 18 mm and the reading after the exposure is 6 mm, the difference in readings is 18 mm - 6 mm 12 mm. 9. If an exposure results in the reading after the exposure being less than 5 mm, recharge the KFM and expose it again for one of the shorter time intervals listed. 10. Use the table attached to the KFM to find the dose rate (R/hr) during the time of exposure. The dose rate (R/hr) is found at the intersection of the vertical column of numbers under the time interval used and of the horizontal line of numbers that lists the calculated difference in readings at its left end. An example: If the time interval of the exposure was 1 MIN. and the difference in the readings was 12 mm, the table shows that the dose rate during the time interval of the exposure was 9.2 R/HR (9.2 roentgens per hour). Another example: If the time interval of the exposure was 15 SEC. and the difference in readings was 11 mm, the table shows that the dose rate during the exposure was halfway between 31 R/hr and 37 R/hr; that is, the dose rate was 34 R/hr. 11. Note in the table that if an exposure for one of the listed time intervals causes the difference in readings to be 2 mm or 3 mm, then an exposure 4 times as long reveals the same dose rate. An example: If a 1- min. exposure results in a difference in readings of 2 mm, the table shows the dose rate was 1.6 R/hr; then if the KFM is exposed for 4 minutes at this same dose rate of 1.6 R/hr, the table shows that the resultant difference in readings is 8 mm. The longer exposure results in a more accurate determination of the dose rate. 12. If the dose rate is found to be greater than 0.2 R/hr and time is available, recharge the KFM and repeat the dose-rate measurement -- to avoid possible mistakes. The dose of fallout radiation -- that is, the amount of fallout radiation received -- determines the harmful effects on men and animals. Being exposed to a high dose rate is not always dangerous -- provided the exposure is short enough to result in only a small dose being received. For example, if the dose rate outside an excellent fallout shelter is 1200 R/hr and a shelter occupant goes outside for 30 seconds, he would be exposed for 1/2 of 1 minute, or 1/2 of 1/60 of an hour, which equals 1/120 hour. Therefore, since the dose he would receive if he stayed outside for 1 hour would be 1200 R, in 30 seconds he would receive 1/120 of 1200, which equals 10 R (1200 R divided by 120 = 10 R). A total daily dose of 10 R (10 roentgens) will not cause any symptoms if it is not repeated day after day for a week or more. In contrast, if the average dose rate of an area were found to be 12 R/hr and if a person remained exposed in that particular area for 24 hours, he would receive a dose of 288 R (12 R/hr x 24 hr = 288 R). Even assuming that this person had been exposed previously to very little radiation, there would still be a serious risk that this 288 R dose would be fatal under the difficult conditions that would follow a heavy nuclear attack. Another example: Assume that three days after an attack the occupants of a dry, hot cave giving almost complete protection against fallout are in desperate need of water. The dose rate outside is found to be 20 R/hr. To backpack water from a source 3 miles away is estimated to take 2-1/2 hours. The cave occupants estimate that the water backpackers will receive' a dose in 2-1/2 hours of 50 R (2.5 hr x 20 R/hr = 50 R). A dose of 50 R will cause only mild symptoms (nausea in about 10% of persons receiving a 50 R dose) for persons who previously have received only very small doses. Therefore, one of the cave occupants makes a rapid radiation survey for about 1-1/2 miles along the proposed route, stopping to charge and read a KFM about every quarter of a mile. He finds no dose rates much higher than 20 R/hr. So, the cave occupants decide the risk is small enough to justify some of them leaving shelter for about 2-1/2 hours to get water. Fortunately, the human body -- if given enough time -- can repair most of the damage caused by radiation. An historic example: A healthy man accidentally received a daily dose of 9.3 R (or somewhat more) of fallout-type radiation each day for a period of 106 days. His total accumulated dose was at least 1000 R. A dose of one thousand roentgens, if received in a few days, is almost three times the dose likely to kill the average man if he receives the whole dose in a few days and after a nuclear attack cannot get medical treatment, adequate rest, etc. However, the only symptom this man noted was serious fatigue. The occupants of a high-protection-factor shelter (such as a trench shelter covered with 2 or 3 feet of earth and having crawlway entrances) would receive less than 1/200 of the radiation dose they would receive outside. Even in most areas of very heavy fallout, persons who remain continuously in such a shelter would receive a total accumulated dose of less than 25 R in the first day after the attack, and less than 100 R in the first two weeks. At the end of the first two weeks, such shelter occupants could start working outside for an increasing length of time each day, receiving a dally dose of no more than 6 R for up to two months without being sickened. To control radiation exposure in this way, each shelter must have a fallout meter, and a daily record must be kept of the approximate total dose received each day by every shelter occupant - both while inside and outside the shelter. The long- term penalty which would result from a dose of 100 R received within a few weeks is much less than many Americans fear. If 100 average persons received an external dose of 100 R during and shortly after a nuclear attack, the studies of the Japanese A-bomb survivors indicate that no more than one of them is likely to die during the following 30 years as a result of this 100 R radiation dose. These delayed radiation deaths would be due to leukemia and other cancers. In the desperate crisis period following a major nuclear attack, such a relatively small shortening of life expectancy during the following 30 years should not keep people from starting recovery work to save themselves and their fellow citizens from death due to lack of food and other essentials. 100 R, even if all received in a day or less, is unlikely to require medical care - provided during the next 2 weeks a total additional dose of no more than a few R is received. 350 R received in a few days or less results in a 50-50 chance of being fatal after a large nuclear attack when few survivors could get medical care, sanitary surroundings, a well-balanced diet, or adequate rest. 600 R received in a few days or less is almost certain to cause death within a few days. To avoid the necessity of repeatedly going outside a shelter to determine the changing dose rates outside, find the shelter's protection factor (PF) by measuring the dose rate inside the shelter as soon as it becomes high enough to be reliably measured. Then promptly measure the dose rate outside. The uncontaminated shelter's PF = Dose Rate Inside/Dose Rate Inside. An example: If the dose rate inside is found to be 0.2 R/hr and the dose rate outside is 31 R/hr, the shelter's PF = 31 R/hr / 0.2 R/hr = 155. Then at future times the approximate dose rate outside can be found by measuring the dose rate inside and multiplying it by 155. Approximate Dose Rate Outside = Dose Rate Inside x PF. If a charged KFM is discharged and reads zero within a second or two after being taken outside a good shelter, this means that the dose rate outside is hundreds of roentgens per hour. Get back inside! Also remember that a 15-second reading is not as accurate as are readings made in longer specified exposure times. Inside most shelters, the dose received by an occupant varies considerably, depending on the occupant's location. For example, inside an expedient covered-trench shelter the dose rate is higher near the entrance than in the middle of the trench. In a typical basement shelter the best protection is found in one corner. Especially during the first several hours after the arrival of fallout, when the dose rates and doses received are highest, shelter occupants should use their fallout meters to determine where to place themselves to minimize the doses they receive. They should use available tools and materials to reduce the doses they receive, especially during the first day, by digging deeper (if practical) and reducing the size of openings by partially blocking them with earth, water containers, etc. -- while maintaining adequate ventilation. To greatly reduce the slight risk of fallout particles entering the body through nose or mouth, shelter occupants should cover nose and mouth with a towel or other cloth while the fallout is being deposited outside their shelter, if at the same time ventilating air is being blown or pumped through their shelter. The air inside an occupied shelter often becomes very humid. If a good flow of outdoor air is flowing into a shelter--especially if pumped by briefly operating a KAP or other ventilating pump - a KFM usually can be charged at the air intake of the shelter room without putting it inside a dry-bucket. However, if the air to which a KFM is exposed has a relative humidity of 90% or higher, the instrument cannot be charged, even by quickly unrolling a roll of tape. In extensive areas of heavy fallout, the occupants of most home basements, that provide inadequate shielding against heavy fallout radiation, would be in deadly danger. By using a dependable fallout meter, occupants would find that persons lying on the floor in certain locations would receive the smallest doses, and that, if they improvise additional shielding in these locations, the doses received could be greatly reduced. Additional shielding can be provided by making a very small shelter inside the basement where the dose rate is found to be lowest. Furniture, boxes, etc. can be used for walls, doors for the roof, and water containers, books, and other heavy objects for shielding -- especially on the roof. Or, if tools are available, breaking through the basement floor and digging a shelter trench will greatly increase available protection against radiation. If a second expedient ventilating pump, a KAP, (or a small Directional Fan), is made and used as a fan, such an extremely cramped shelter inside a shelter usually can be occupied by several times as many persons as can occupy it without forced ventilation. The KFM instruction pages are printed so that they can be readily cut out and pasted up (using the "LAYOUT FOR 12-PAGE TABLOID" given on page 242) to expedite rapid reproduction preparatory to mass distribution. No authorization is required to reproduce this survival information. All of the paste-ups should be photo-reduced to fit your size newspaper, EXCEPT four cut-outs [paste-ups (15), (18), (21) and (24)] and one drawing [paste-up (26)] SHOULD REMAIN AT 100%. To make the instruction pages fully camera-ready for paste-up and photographing, it is necessary: (1) To cut off each page's title and number (such as "INSTRUCTIONS, Page 2" and "2l4"); (2) To use a camera-invisible blue pencil to copy the numbers on the back of each page onto the front of that page, writing them in a blank space nearest to the approximate original position of the numbers; (3) To cut out each of the 40 paste-ups. On the back of each paste-up are the number of the tabloid page to which the paste-up is to be attached and (in parentheses) the number of the paste-up itself. For example, on the back of "INSTRUCTIONS, Page 2" are printed the following: "Pg 1- (2)" and "Pg 1- (3)." Thus, this page contains two paste-ups, both of which should be attached to page 1 of the tabloid paste-up. The positions in which they should be attached to page 1 are shown in the layout sketch on page 242. Timed field tests by two newspapers have shown that less than 40 minutes is required to begin printing a KFM tabloid. Each test began when the newspaper was given only written instructions like this page and the following layout page, along with KFM instructions like those in this book except that the index numbers were already printed in camera-invisible blue on each half page of the instructions. The camera-ready copy is for use with a straight lens (100%, horizontal and 100% vertical reproduction). Fig. Pg. 241 TABLOID LAYOUT SHEET and CENTER FOLD OF A 12-PAGE TABLOID, INDICATING TABLOID Page 6 AND Page 7. All photographs are 85-line screen. 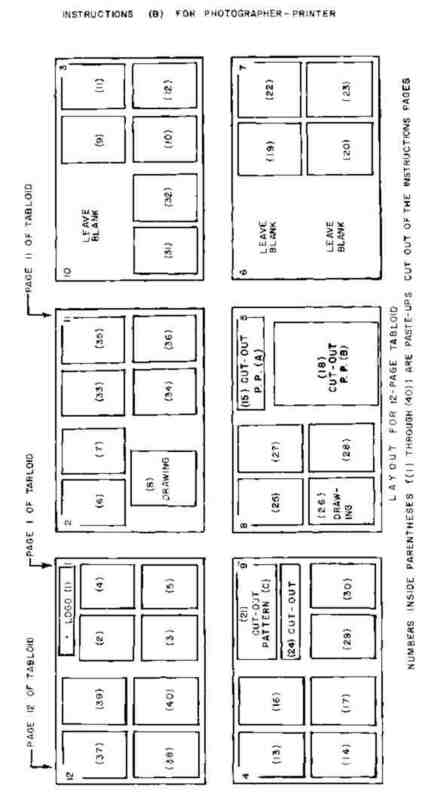 The following layout sketch for a 12-page tabloid indicates where each of the numbered paste-ups [(1), (2),... (40)] should be pasted-up and what spaces should be left blank. This positioning of the paste-ups is necessary to permit a KFM-maker to cut out the patterns without destroying any instructions printed on opposite sides of the 12 tabloid pages.